Uncover Exceptions Easily and Certify Financial Statements with Confidence. With increasing regulatory requirements for financial institutions and the need for executive management to sign off on financial statements, it is critical to ensure that there is detailed visibility into the underlying financial data. Ongoing emphasis on having a strong internal control structure for insurers brings into light reconciliation and certification as being the critical components to making it happen. When done properly, they assure accuracy of information flowing into the financial close process, with minimal risk of misstatement, and a full audit trail. 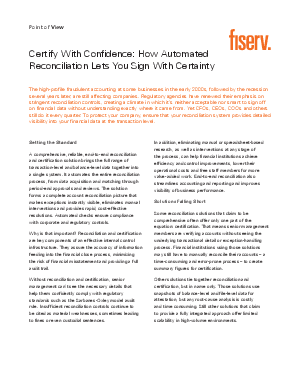 The white paper, Certify with Confidence: How Automated Reconciliation Lets You Sign With Certainty, explains how a comprehensive reconciliation solution should work In today's regulatory climate, and why a comprehensive, end-to-end, automated reconciliation system is essential to protecting yourself and your company.